Here's some news about a film we're very excited to see movement on. 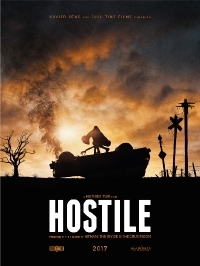 Late last year we announced that French director and friend to QE Mathieu Turi had partnered with Xavier Gens (The Divide, Frontier(s)) to produce his first feature film called Hostile, a post-apocalyptic horror thriller with a great concept. Now we're hearing out of Cannes that the film has its official cast locked in Brittany Ashworth (The Crucifixion) in the lead, Javier Botet (Crimson Peak, The Revenant) and GrÃ©gory Fitoussi (World War Z, GI:JOE). "I feel really lucky to have such an amazing cast for HOSTILE," said Turi. "Brittany, GrÃ©gory and Javier are all incredibly talented and I just canâ€™t wait to start work with them." She wakes up upside down, stuck in her car with a broken leg, in the middle of the desert, and... it's nighttime. Incidentally, here's an old interview we did with Xavier Gens about The Divide.